The Army’s decision to change its marksmanship training and make the test more realistic has a lot going for it. If signed into policy, it will hopefully make soldiers more lethal. But there’s a basic piece of physics that a lot of soldiers, especially support soldiers who often fire at paper, don’t think about when firing, that will become more important if the Army really does get rid of “paper” qualifications: gravity and bullet rise/drop. Rifle ranges are fun! If you know what you’re doing. Hello shooters! If you’re a perfect shooter, who has no issue hitting targets, keep doing what you’re doing, don’t read this. In fact, a shooter perfectly applying the four fundamentals of marksmanship, meaning their point of aim is always center mass at the time they fire, will never miss a basic rifle marksmanship target regardless of whether or not they understand bullet drop. So, feel free to go watch cat videos. Congrats! If you are missing, especially missing when firing at the mid-range targets, then start aiming at the targets’ “belly buttons” when they’re between 100 and 250 meters away. Only do this at ranges from 100 to 250 meters. Do not, repeat, do not aim low at 300-meter targets. I originally got this advice from an artillery observer turned military journalist at Fort Bragg who qualified expert all the time, and it really does help a lot of shooters. If you want to know why it works, keep on reading. An Army table from FM 3-22.9 illustrating the rise and then drop of M885 ball ammunition fired from M4s and M16s. 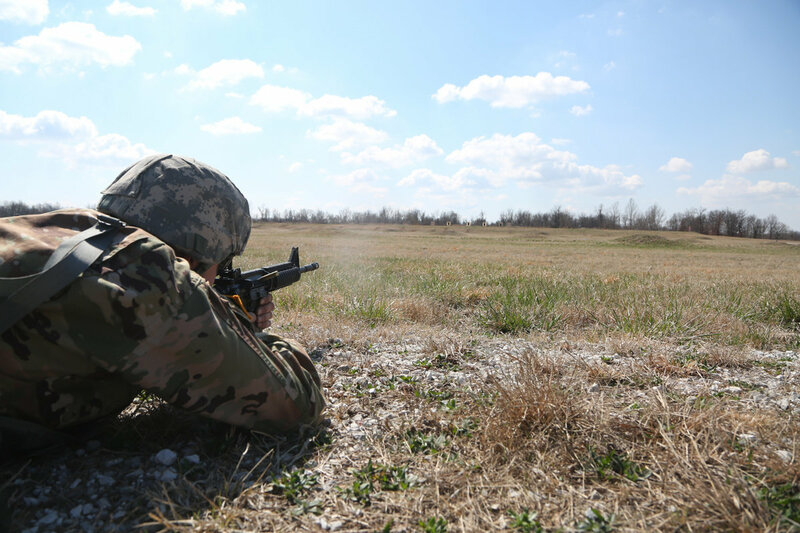 Right now, soldiers can take one of two tests when qualifying on their rifles. They can fire at pop-up targets on a large range or at a paper target with small silhouettes just 25 meters away. The paper target ranges are much easier for commanders and staff to organize, but are nowhere near as realistic. For shooters firing at paper targets 25 meters away, their point of aim and point of impact should be exactly the same. Point of aim is the exact spot that the shooter has lined up their sights. Point of impact is where the round actually impacts. 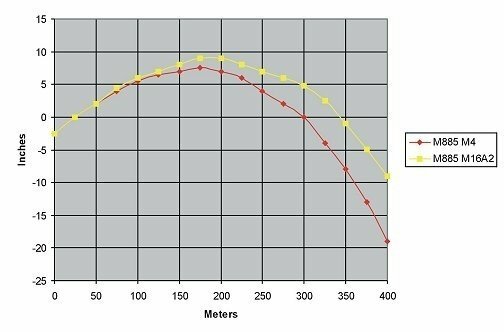 An M4 perfectly zeroed for 300 meters, as is standard, should have a perfect match between point of aim and point of impact at both 300 meters and 25 meters. So, when a shooter is firing at a paper target 25 meters away, the rounds should hit where the shooter is aiming. 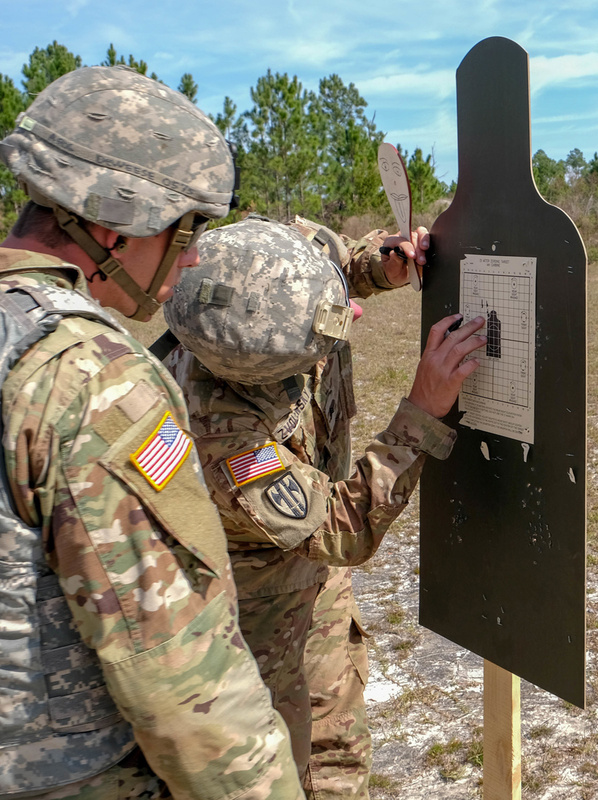 But bullets don’t fly flat, and shooters used to paper who get sent to a pop-up range under the new marksmanship program will have to learn to deal with bullet drop. Properly zeroing your rifle is super important. First, a quick primer on the ballistics of an M4 and M16. The rounds are small but are fired at extremely high speeds, over 3,000 fps. But they aren’t actually fired exactly level with the weapon sights, because the barrel isn’t exactly level with the sights. Instead, the barrel is tilted ever so slightly upward, meaning the bullet is fired slightly up into the sky when a shooter is aiming at something directly in front of them. This is by design, because gravity begins affecting a bullet the moment it leaves the barrel (up until that point, it is supported by the barrel or magazine.) Basically, the designers wanted to help riflemen shoot quickly and accurately in combat, so they tilted the barrel to compensate for gravity. The barrel points up because gravity pulls down. And the designers set the weapon up so these effects would largely cancel each other out at the ranges that soldiers operate at most often. This worked out to about 300 meters, the same ranges the Army currently tests soldiers on their ability to shoot. Basically, the barrel’s tilt causes the round to “rise” for the first 175 to 200 meters of flight when it runs out of upward momentum. Then, gravity overcomes the momentum, and it starts to fall. An E-type silhouette is 40 inches tall. If a shooter aimed at the exact center of the target, that would be the red dot. An M4’s rate of bullet climb with M885 ball ammunition would create a point of impact at the blue dot, 6 inches above point of aim. M16s have an even more pronounced bullet rise. So, when an M4 is properly zeroed to 300 meters, then the point of aim and point of impact should be exactly level at 300 meters. But remember, it’s an arc. And the opposite side of the arc, and the bullet is falling to level with the sights at 300 meters. The opposite side of the arc, the spot where the bullet has climbed to the point of aim, is at 25 meters. So, when firing on an Alt C target at 25 meters, a shooter would never notice the problem because the point of aim and point of impact would match. But when firing on a pop-up range with targets between 50 and 300 meters, some people will accidentally shoot over the target’s shoulders or even the target’s head. That’s because an M4 round has climbed as much as 6 inches at 200 meters and is only just beginning to fall. (An M16 round climbs even higher, about 9 inches, but those weapons are less common now.) That can put the round’s point of impact at the neck of the target, a much thinner bit of flesh to hit. So if a shooter has a tendency to aim just a little high when under the time pressure of the range, that high point of aim combines with the climb of the point of impact to result in a shot over the head. If the shooter aims just a little left or right, they’ll miss the neck and hit air. The easy way to compensate for this is to imagine a belly button on the targets between 100 and 250 meters. That way, the 4-6 inches that the point of impact is above the point of aim will result in rounds hitting center of the chest. If the shooter aims a little high, they are still hitting chest or neck. Left and right is just more abdominal or chest area. Obviously, if the shooter is aiming in the dirt, they could still hit abdominal but might even bury the round if they’re really low. But, remember, this only applies to targets between 100 and 250 meters where the rise of the round from the tilted barrel has significantly changed the point of impact. Shooters should just aim center mass at the 50 and 300-meter targets. And, if all of this is too complicated, don’t worry too much about it. Perfectly shot rounds, with all four fundamentals of marksmanship perfectly applied, will always hit the target anyway. That’s because the Army uses E-type silhouettes at all the distances where this matters, and E-type silhouettes are 40 inches tall. If the point of aim is center mass, then the round’s climb of 6 inches will still put the point of impact in the black.